The mirror folds back to almost 180 degrees. So well thought out. I think these will become popular here because of the easy blendability and quick application. 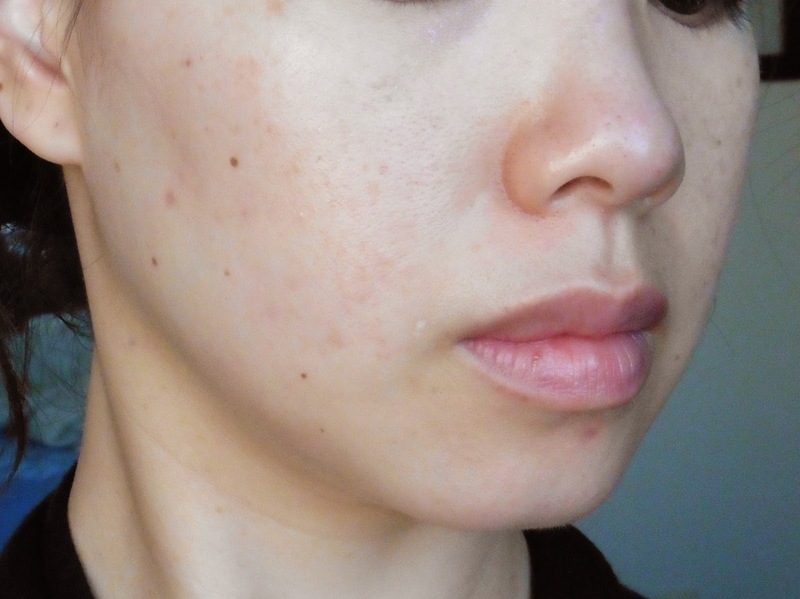 For background, I generally don’t like liquid bases (even BB creams and tinted moisturizers) because they don’t seem to work with the texture of my skin: big pores, peach fuzz, occasional dry flakes. Liquid bases just emphasize all of the above and worst of all, as the day goes on, they turn patchy. Maybe from oil breaking them down (my nose) or perhaps from dry skin soaking them up (ew). The cushion is covered by the white plastic lid on which the sponge lays. 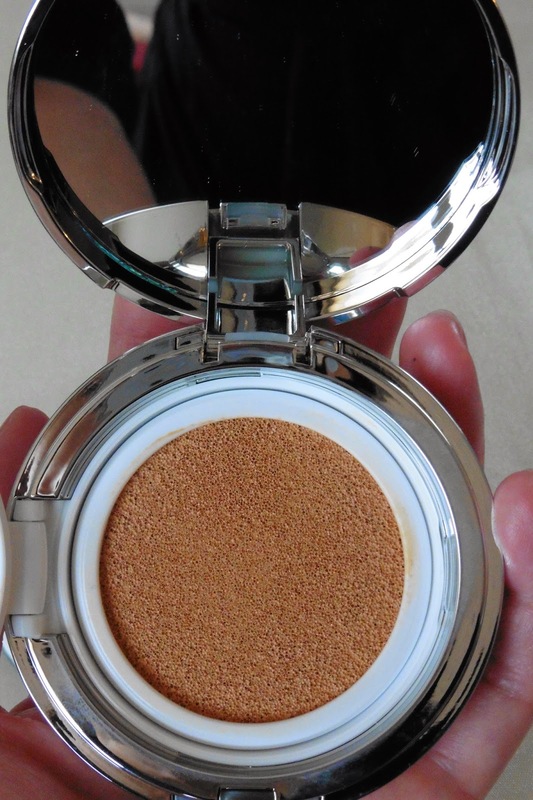 Cushion compacts are a very different type of liquid makeup. 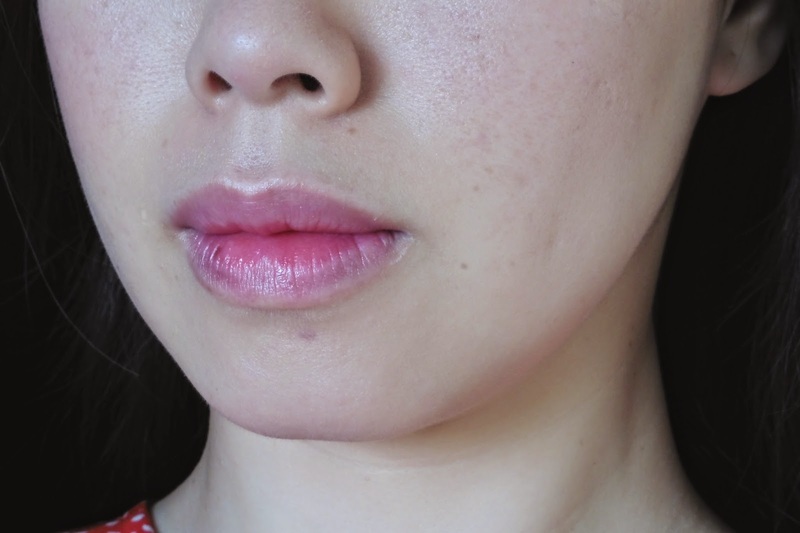 They are essentially sponges soaked in a thin, light liquid makeup or BB cream. Not so thin that it would drip or leak if you turned it upside down, but thin enough that it blends easily into skin. The cushion looks way darker than the liquid actually is. 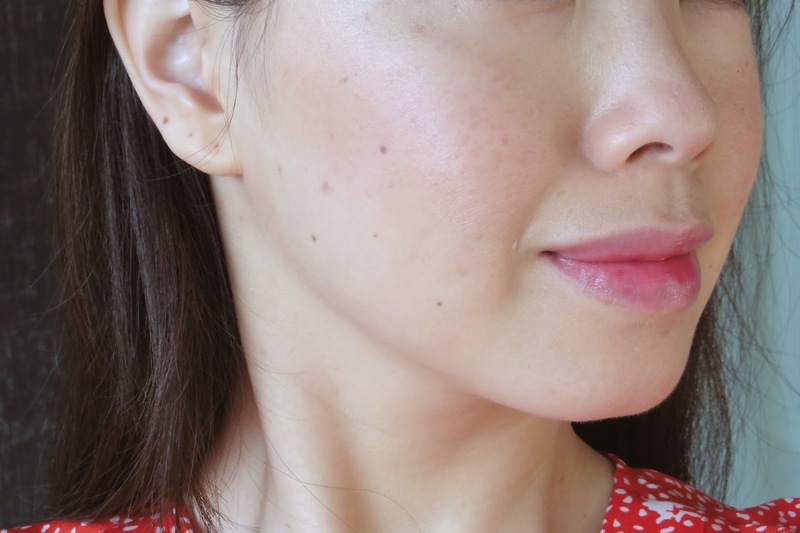 I wear shade 104 Tan Blush, which the QVC color chart describes as suitable for fair skin with a pink undertone. I usually think of myself as having yellow undertones, which should align with 204 Tan Gold, but I’ve swatched that at Sephora and that seems too dark. 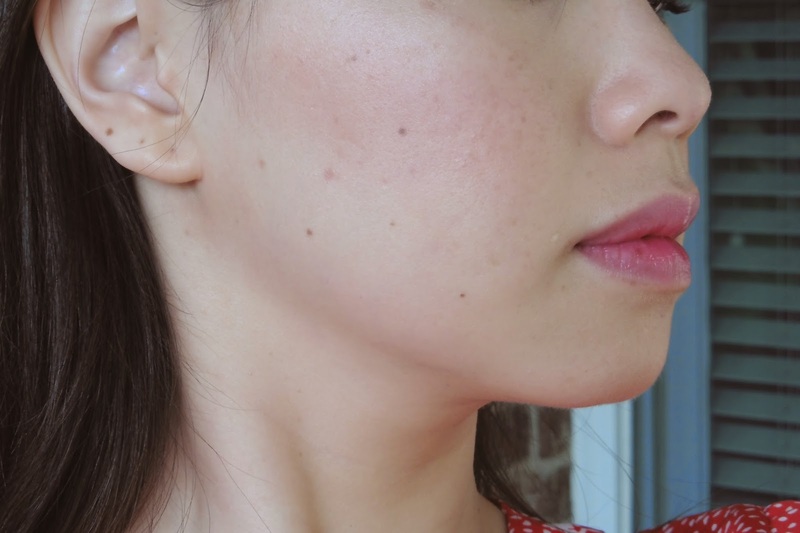 Anyway, 104 Tan Blush seems to be the fairest available shade (in the U.S. anyway) and is a good match for my summer color, which is around a MAC NC20. 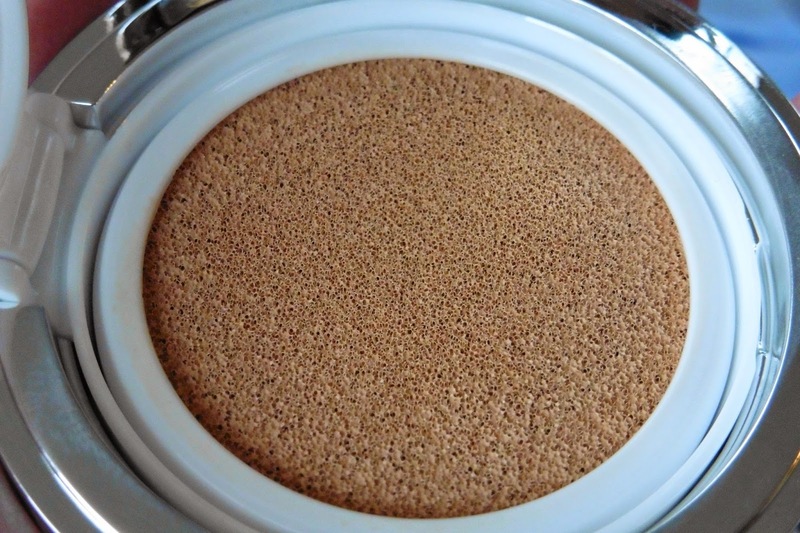 Despite the description, 104 Tan Blush is a fairly neutral beige as opposed to a pink-beige. The shade is too dark during other seasons, when I’m MAC NC15. Rubycell sponge/puff: wash and air dry if it gets gunky. 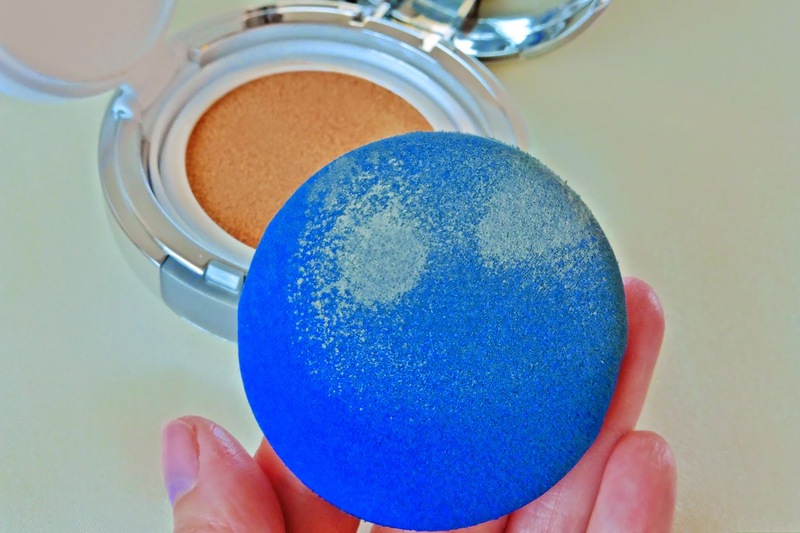 To apply, just lightly dab the sponge–the unique Rubycell sponge/puff, which doesn’t soak up the foundation and applies the lightest layer of liquid–into the cushion and pat onto the face. Don’t rub or buff the product in; simply pat pat pat until all is blended. Coverage is sheer to medium. 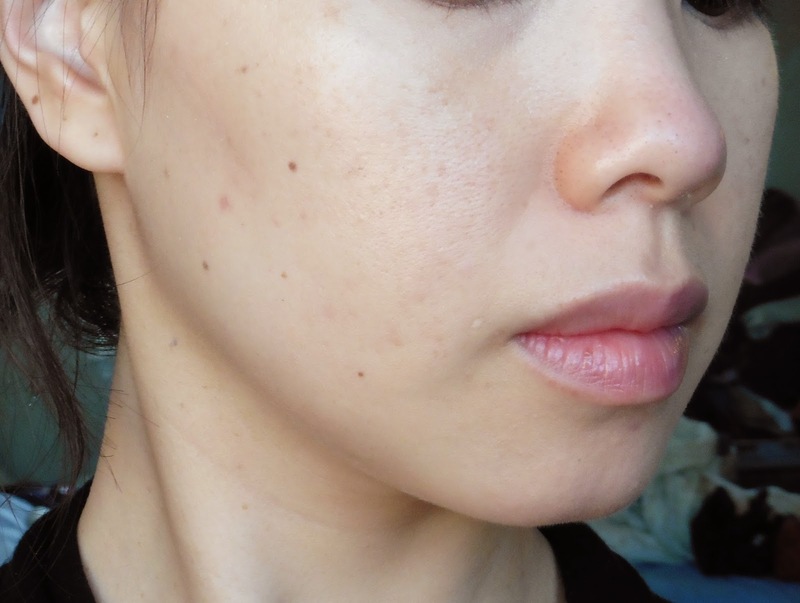 I usually stop at two layers and, as you can see in the photos, this will even out skintone but cannot cover up blemishes and spots. The finish is a satiny, slightly shiny finish and will crease under the eyes, so I like to powder over it before moving onto the rest of my makeup. I still use mineral powder foundation on my nose though, because–for all the problems with liquid bases mentioned above–it doesn’t work on my nose. 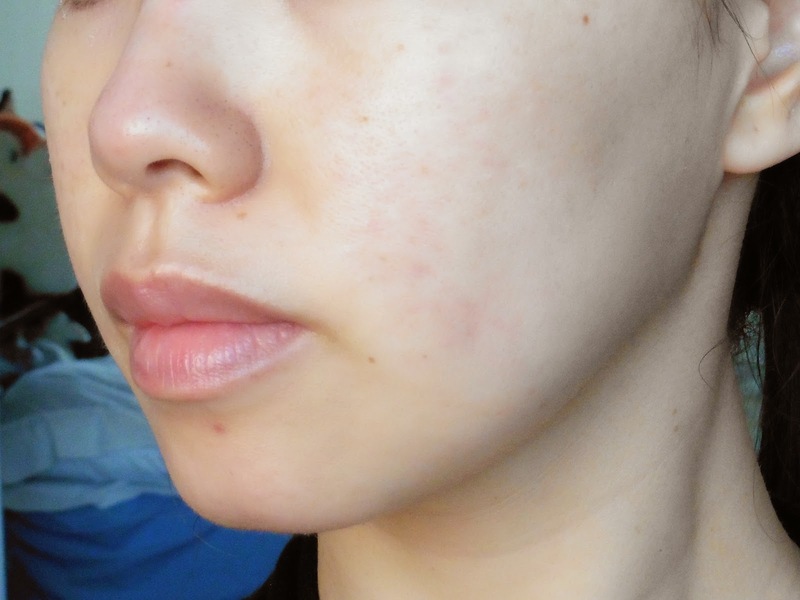 Before: Sun spots and acne marks, including recent acne mark on chin. After one layer: Skintone is evened out. Spots are softened but still visible. After two layers and my usual spackle: No concealer, but I did apply finishing powder (Hourglass Ambient Lighting Powder), blush, highlighter, and bronzer. After two layers and my usual spackle: Notice the soft glow. Spots are still visible, but the overall effect is softened and polished. I also love the SPF 50+ although, honestly, the liquid is so thin and you shouldn’t be applying foundation like icing on a Funfetti cake, so the effective SPF must be way lower. So I’ll amend my opinion to say that I love the placebo effect of SPF 50+. In the absence of heavy sweating and rubbing and with finishing powder, the coverage lasts a full day (which to me means 12+ hours). 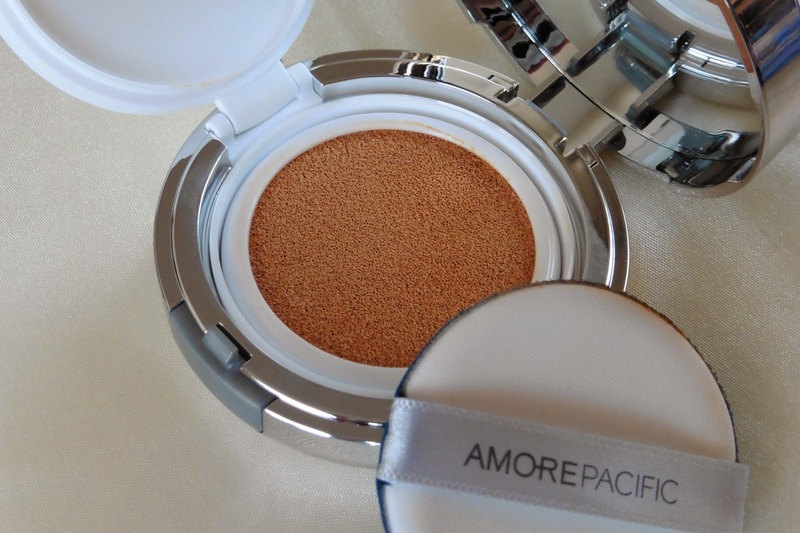 I have to say that the cushion compacts that I have (AmorePacific, Laneige, and HERA) are all fairly similar despite their varying prices so do check out some of the cheaper ones if you just want to dip your toes. Same Rubycell sponge. Same packaging (the refills and compacts are all interchangeable! So buy just the refills on eBay). 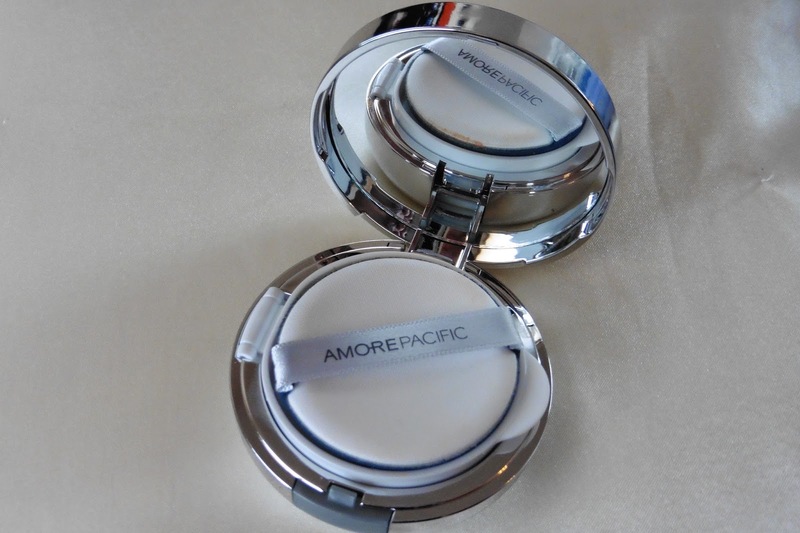 All come with a mirrored compact plus two cushions (i.e., one in the compact and one refill; each cushion/refill comes with a new sponge). The finishes and coverage might vary a little–for example, some might be glowier or more matte, and some might be meant to be sweatproof–but Korean foundation normally utilizes a uniform numbering system across brands, meaning shade 21 in Laneige should correspond with shade 21 in AmorePacific and HERA. (I have shade 21 in HERA and so I would guess that corresponds to MAC NC15.) In my experience though, the fairness/depth of a shade is fairly equivalent, but the undertones can still differ so just be aware of that. I feel a sense of accomplishment with this product because I can actually use it up in one summer. 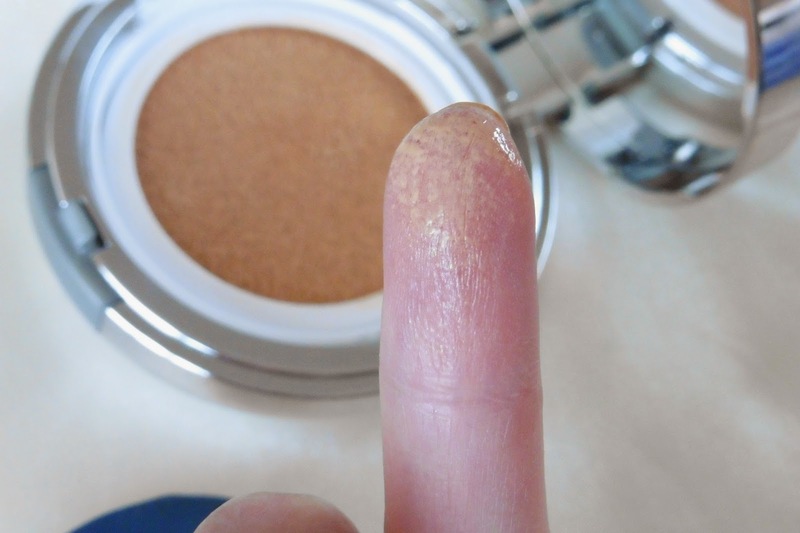 (For comparison, I’ve taken 2 years to finish a mineral powder foundation worn daily.) To some folks, maybe that feels like you’re not getting your money’s worth. 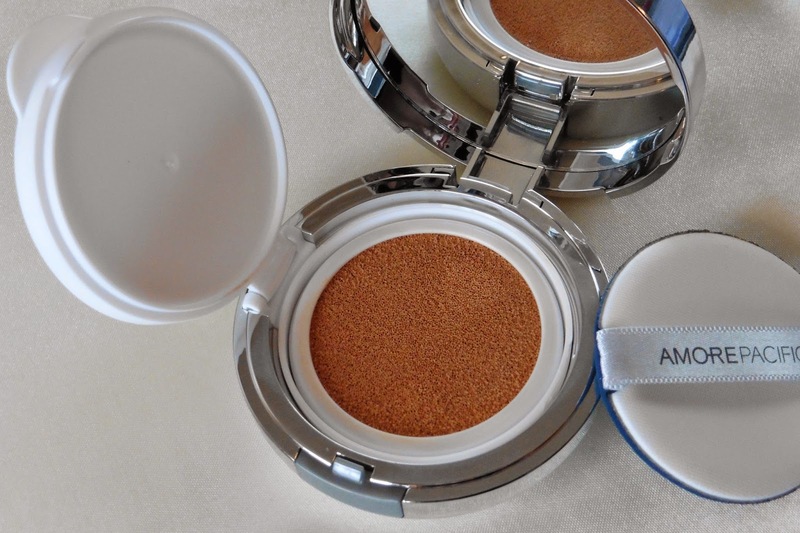 To stretch the foundation out a leeeetttle bit longer, turn the compact or the cushion upside down or remove the cushion to dab at the bit of foundation that has pooled on the bottom of the compact. UPDATE: I reviewed the Laneige and HERA cushions here.